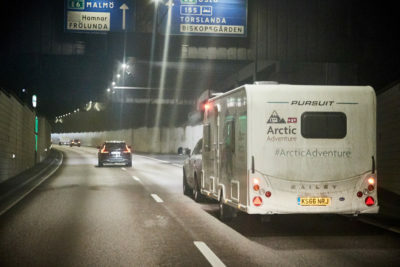 Meeting the Bailey of Bristol team to talk about the possibility of an Arctic travel project seems like a lifetime ago and it still seems bonkers to think that an opening sentence as simple as ‘can we tow a caravan to the Arctic Circle in winter?’ can lead to a bunch of people achieving it. 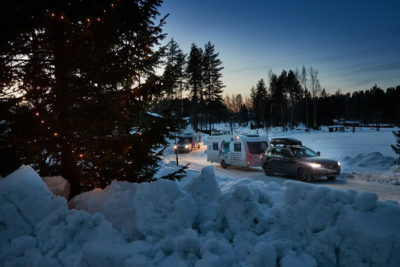 This ‘can we…?’ vibe continued with random suggestions such as ‘can we drive across the Oulu-Hailoutu ice road?’ and ‘can we see Father Christmas at Rovaniemi?’ before they eventually morphed into reality. 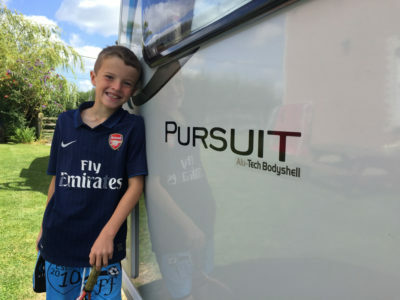 The time/conditions equation was our greatest challenge, but a necessary evil, as the aim was to test Bailey’s Approach motorhome and new Pursuit caravans to the limit with a gruelling itinerary that, at times, included four countries in a single day. We visited France, Belgium, Holland, Germany, Poland, Lithuania, Latvia, Estonia, Finland, Sweden and Denmark in just 16 days before making our way back to the UK 5,000 miles later. The team at Caravan Guard issued me with a theoretical challenge based on their European cover options – how far could 240 days of Caravan Guard cover take you? 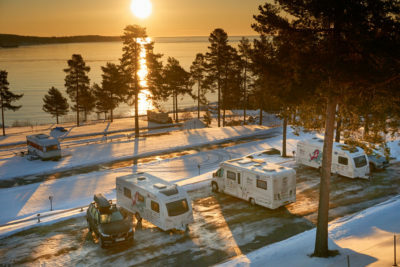 Caravanners who insure with them can enjoy the freedom to take trips abroad for up to 180 days, but can also pay to extend this up to 240 days. Even from the comfort of the sofa, dreaming of a trip of his magnitude is comparable to a Willy Wonka travel ticket, but my thoughts took a turn when I discovered how many countries are covered under their caravan insurance policy. My brain encounters similar stresses when visiting a restaurant with a large menu where choosing what to eat is hampered by too much choice! So, armed with my daughter’s globe and a deep breath, I began to read the enormous list of counties that I could visit with the caravan: Albania, Andorra, Austria, Belarus, Belgium, Bosnia and Herzegovina, Bulgaria, Croatia, Cyprus, Czech Republic, Denmark, Estonia, Faro Islands, Finland, France, Germany, Gibraltar, Greece, Hungary, Iceland, Italy, Latvia, Liechtenstein, Lithuania, Luxembourg, The Former Yugoslav Republic of Macedonia, Malta, Moldova, Monaco, Netherlands, Norway, Poland, Portugal (including Madeira), Republic of Ireland, Romania, San Marino, Serbia and Montenegro, Slovakia, Slovenia, Spain (including Balearics and Canaries), Sweden, Switzerland, Turkey and Ukraine. Oh, and in case there’s any doubt, any country which is a member of the European Union is covered. Initial calculations (approximations) revealed that I could spend the thick-end of a week in almost all the countries listed above or I could cherry pick a few for an extended stay, spend a couple of days in the countries that made it to the B-list and juggle the list again after next year’s insurance renewal. 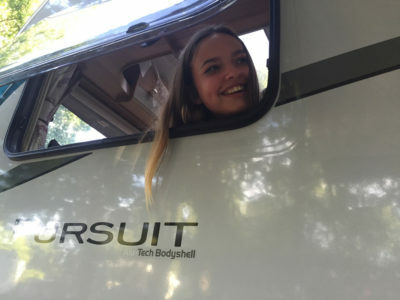 Our reasons for buying a caravan a dozen or-so years ago was to explore as a family in a manner that my freelance budget will allow, so I feel duty bound to bring the kids, even though the sky’s the limit on my European imaginarium. Gotta love the human psyche. 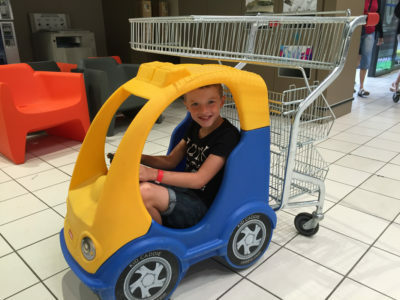 Even though I’ve opened myself up to an endless cycle of ‘Are we there yet?’ inside my head the 34 weeks and two days of travel cover can break actual travel time into manageable, bite-sized chunks that even a hyperactive nine-year-old can manage. The Eurotunnel always blows my kid’s minds so undersea travel is a must wherever possible, followed by our fave overnighter, Chateau de Gandspette which is next door to a WW2 V2 rocket base. I’ve always been envious of the folks we meet on site who are spending a week or two in Northern France before heading south for months at a time, and for the purposes of this imagined trip, I’ll be doing the same for a further 239 days. 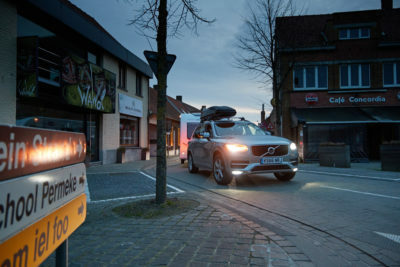 During the Arctic Adventure trip, France was a stepping stone for Germany, Poland and, eventually, cooler temperatures. This time, we’ll be hugging France’s coastline towards Normandy where I’ll squeeze in as many D-Day attractions as possible before my wife calls time on my historical detour. 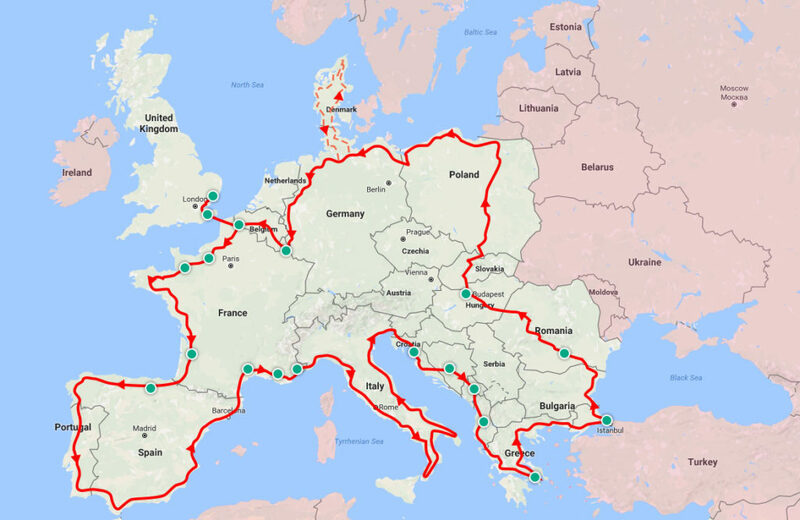 France deserves at least a month and such is our love of Brittany, we could put a serious dent in available days unless we hitched-up and headed-off for the Bay of Biscay, where we’d giggle about the time we accidentally cycled onto a nudist beach. Glossing over how British we felt dressed in shorts, t-shirts and cycle helmets, we’d also sample Bordeaux on our way to Bilbao. I’m no stranger to Spain but I’ve yet to head east towards Portugal, so I’d happily spend another four weeks exploring both countries as I continue my long-way-round coastal journey. Montpellier, Marseille and Monaco offer a welcome return to France with crossing the Italian border being a first for me, imaginary or otherwise. With the toe, heel and calf of Italy behind us, Croatia beckons and having heard so many good things about this sovereign state, it’s worthy of a week at least. Our journey continues through Bosnia, Montenegro and Albania before reaching the southern tip of Greece. A day or two exploring Istanbul’s Old City would be time well spent before heading around the Black Sea in a clockwise direction, passing through Bulgaria to visit Romania’s capital Bucharest, with its tree lined boulevards and glorious buildings. Although this milestone makes me think ‘what if?’, it’s handy to know that Caravan Guard insurance cover includes recovery and repatriation if the caravan is damaged and can’t be towed. 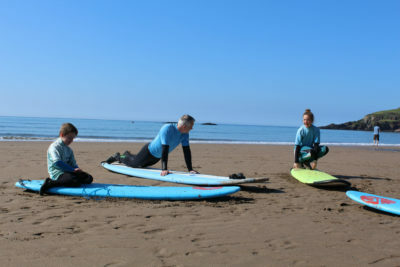 What’s more, alternative accommodation is covered up to policy limits, although my children would undoubtedly complain about missing their own beds in the caravan. Having looked at St Petersburg as a possible #AcrticAdventure destination, venturing into Russian territory with caravans, cameras and crew came with its own unique complications, so as we did in northern Finland, we’ll keep the border to our right and head into the heart of Europe and take in another capital city – Budapest in Hungary. We might be leaving the coast firmly behind us, and cries from the children, but these former Eastern Bloc cities have lots to offer and are steeped in historical beauty, with amazing food, markets and museums – and not forgetting the vineyards en route! Communist Block influences were in abundance when we headed for the Arctic and this trip is a perfect opportunity for the family to share some of the sights I relished as we head north through Slovakia and into Poland. 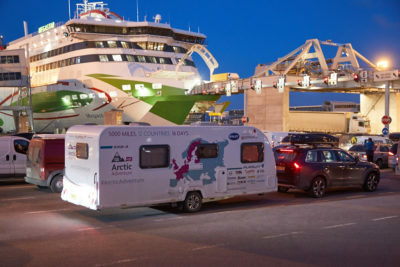 Sat on my sofa basing this trip on my own previous experience of towing a caravan 5,000 miles in 16 days, the sun is continually shining as we crunch some serious mileage and head to the coastline of the Baltic Sea, daring each other to dip our collective toes into its frosty waters! Good insurance cover means peace of mind and I remember with fondness how keen the Latvian and Estonian folks were to overtake everything in their path, with double white lines and brows of hills seeming to egg them on. The Tallinn ferry can deposit you in Helsinki, but having headed north into Latvia, Finland and Sweden a matter of weeks ago, I’ll mentally head west, skirting the exclave of Kalingrad. The roads we encountered in Poland were either empty and arrow-straight, or tight and twisty with progress measured accordingly, so I’d use Denmark as a contingency country, covering the entire Danish coastal route if we have sufficient days in the bag. During the Bailey trip, we travelled from Copenhagen to Harwich in less than a day but with one eye on remaining days, I’d adjust the return journey to suit, popping into the fabulous Luxembourg City if possible, retracing the incredibly scenic route we took through the Ardennes with the caravan a few years ago. 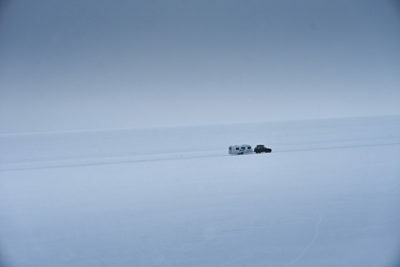 Granted, most of this trip is fantasy, using my recent experience of towing a caravan 280km inside the Arctic Circle and back again in just 1/15th the time a Caravan Guard insurance policy would allow. 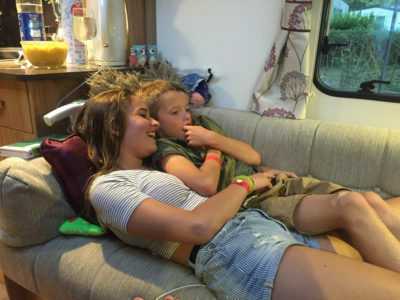 As our initial meeting at Bailey proved, however, some of the best experiences need a catalyst and what better than having up to 240 days of travel cover included in your caravan insurance policy? Before heading on a trip across Europe make sure you check with your tow car insurance provider in case you need a green card to drive in certain countries. It’s also worth checking out Foreign Office advice on the countries you plan to visit to make sure they’re safe for travel. Their foreign travel advice page allows you to search by country. Click to find out more about our caravan insurance and European breakdown cover. 180 days of European cover is included on our caravan insurance policies but can be removed or extended as needed. Your turn! Why not tell us about an amazing touring trip you’ve made in the past, or perhaps a caravanning adventure you’re desperate to make? What countries would you like to visit? Add a comment below. An interesting and stimulating article which informed on the available insurance cover whilst keeping you reading. It certainly got my ‘touring’ juices flowing.